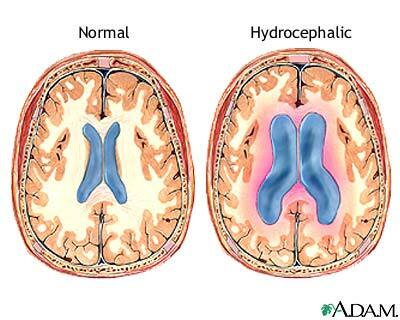 In hydrocephalus, the ventricles of the brain become enlarged with cerebrospinal fluid. This condition causes the brain tissue to become compressed against the skull, thus causing serious neurological problems. Shunting, called ventriculoperitoneal shunting, is necessary to drain the excess fluid and relieve the pressure in the brain. This should be done as soon as hydrocephalus is recognized to give the child the best possible neurological outlook.